EVERYONE is invited to the program! Our speaker will be Snapshot WI coordinator, Jen Stenglein, who will talk about the Snapshot program which places motion activated cameras on public and private land throughout WI. We had a GREAT evening with the bats at the 2018 annual meeting! Did you realize that when you meet a bat face to face, it is really cute! Beautiful brown eyes, very attentive expression, cute wiggling ears . . . This was the subject of the program at our annual meeting in April 2016 and the study is continuing in the Hoyt Park neighborhood. 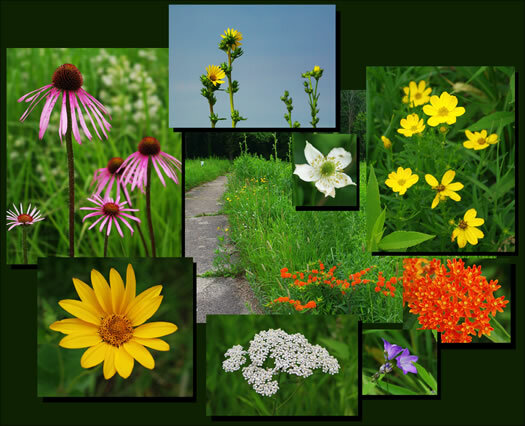 Summer Photos of Ready Prairie! These flowers will be back with us soon! Please renew your membership to FHP for calendar year 2017 or become a member using our 2018 membership form. Your volunteer and financial support helps maintain the award winning activities of FHP so that you may enjoy a great neighborhood park. We encourage you to check the box for emailing newsletters so more of your donation goes to Park projects. Make your generosity count this holiday season. Please give to The Friends of Hoyt Park. All donations are tax deductible. Mail to: FHP, Inc., P O Box 5542, Madison WI 53705-0542. This is a social media site for biological observations. Record plants and animals you observe in the park to share with others or to ask for help with identification, and see what others have observed. The thumbnail photos are some of the recent observations. The FHP Board meets every month, except August and December, on the 2nd Thursday of the month in one of the meeting rooms at Sequoya Library, 4340 Tokay Blvd., from 6:45 to 8:45 p.m. (unless otherwise noted). All members and concerned citizens are welcome. There is a standing agenda item for public comments. Meeting minutes and other documents will be posted on the web site. Donate to become a member of the Friends of Hoyt park. copyright 2001-2015: The Friends of Hoyt Park, Inc.